If you drive past the site of the new Sixth Street Viaduct, you will see more and more Y-shaped structures framing the entire length of the new bridge. The huge structures are the concrete columns that will hold up the deck of the bridge. As we start to pour concrete into the Y-shaped frames, you can get a better feel for what the concrete of the finished bridge will look like. Very cool! 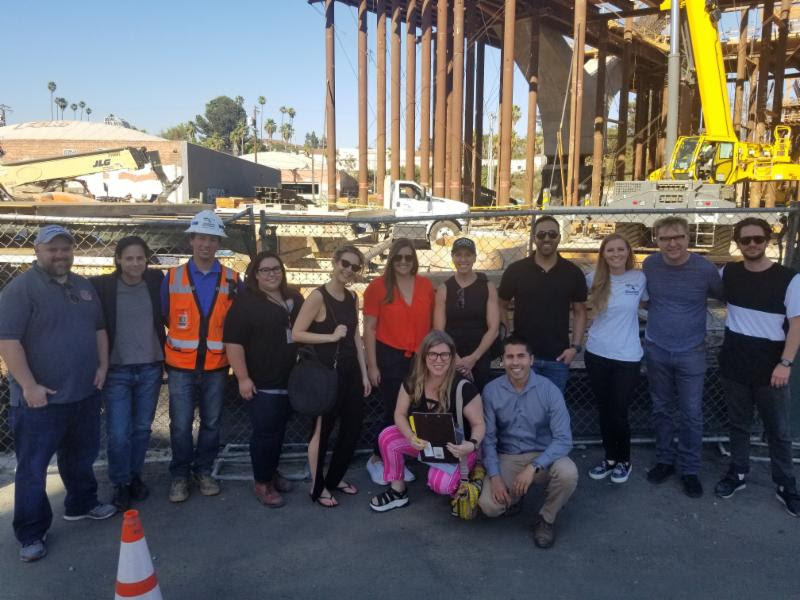 The Sixth Street Viaduct Project team welcomed members of the Los Angeles River Artists and Business Association (LARABA) for a project site tour and construction update this week. LARABA is a longstanding supporter of the Sixth Street Viaduct Replacement Project. During the tour, project staff and community members discussed their vision for the future of the neighborhood and how the new Sixth Street Viaduct will continue to be a Los Angeles icon of unity and connection. We also gave LARABA an update on the new park space that will be built underneath the bridge. They were excited to learn about the enhanced access to the LA River and how the space will be a great destination for local families and visitors alike. LARABA has a long history of supporting community betterment initiatives including planting trees, and opening and maintaining the Arts District Dog park. Members of LARABA have been actively engaged in the planning for the viaduct project as they continue to ensure the finished project is an asset to all Angelenos. For more information about LARABA or to learn how to get involved, please visit: www.laraba.org.